The rain ponchos have had a good work-out in Thailand but especially in Ranong as it always seems to be raining…hard! So much so that I slipped on an unsuspecting left-over prawn in the seafood market. Luckily, I didn’t hurt anything as I wouldn’t fancy ending up in a Thai hospital! 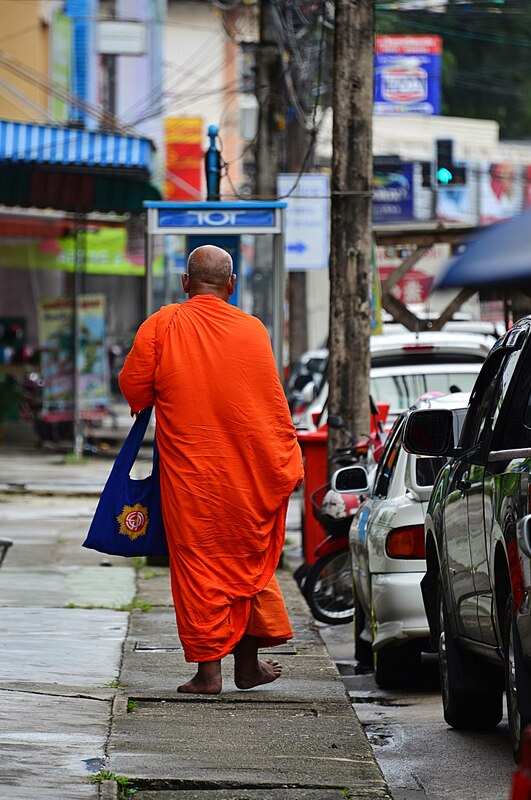 Ranong is a very different city to others in Thailand…it’s quiet! 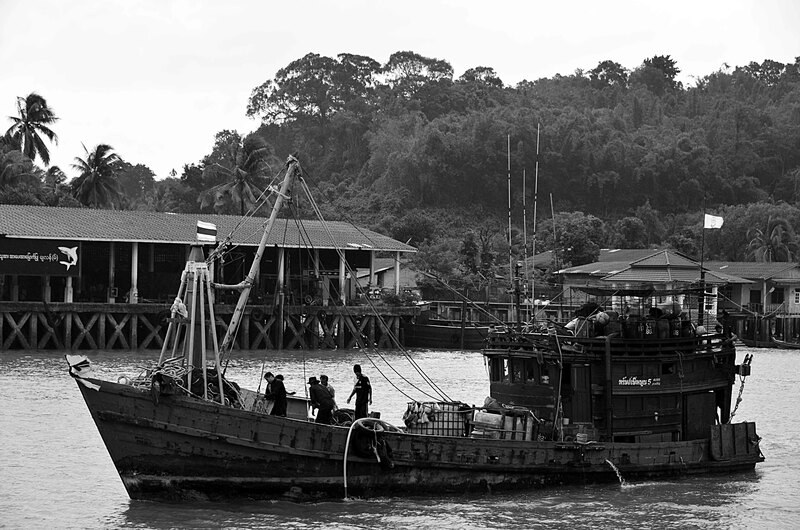 The city is renown as a visa-run destination because of the border access via boat to Kawthoung in Myanmar. Predominantly, Burmese migrants cross the border to renew their visa. So, there seems to be a constant source of transients, which is not a bad thing, and does make things interesting. Although, I notice more security bars on windows and broken glass cemented into high fences, than in other Thai towns or cities, so far. 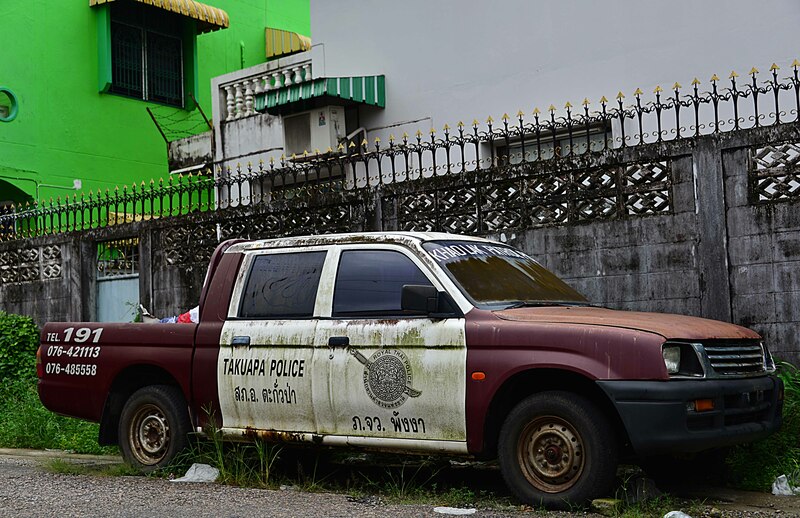 People are either paranoid or there is a lot of crime in Ranong. The central markets sell mainly imported Burmese foods and clothing. You can also find fresh produce such as fruit, vegetables, fried foods, cakes, take-away rice and curry in bag. This is also a great place to take photos and watch the different interaction between the Thais and Burmese. The seafood market seems to be where all the action is and starts at around 5 am (if you’re up), as this is when the auction starts. 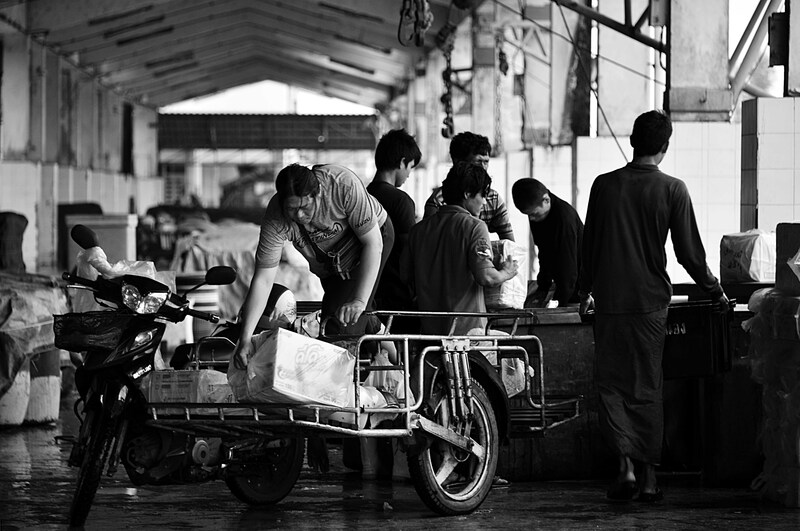 Arrived too late and all the seafood was gone apart from a slippery stray prawn on the floor, auction tickets strewn across the market’s ground, and cleaners doing their daily magic. 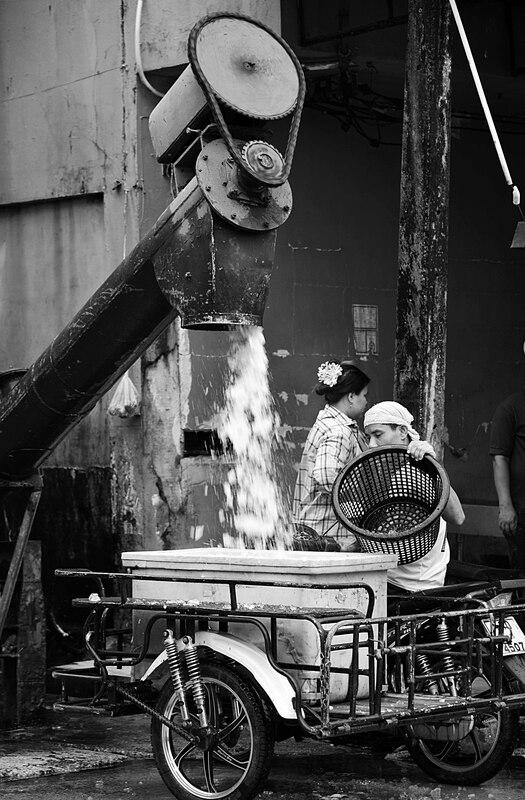 Whilst at the market, check out the port itself as it is very interesting and lively. 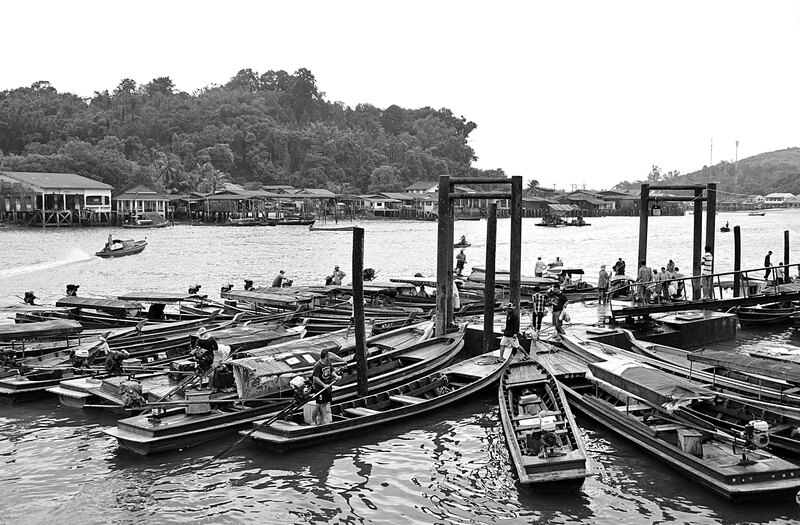 Here, you can observe traditional seafaring life with local timber boats doubling up as water taxis but also laden fishing boats, plying through the river. 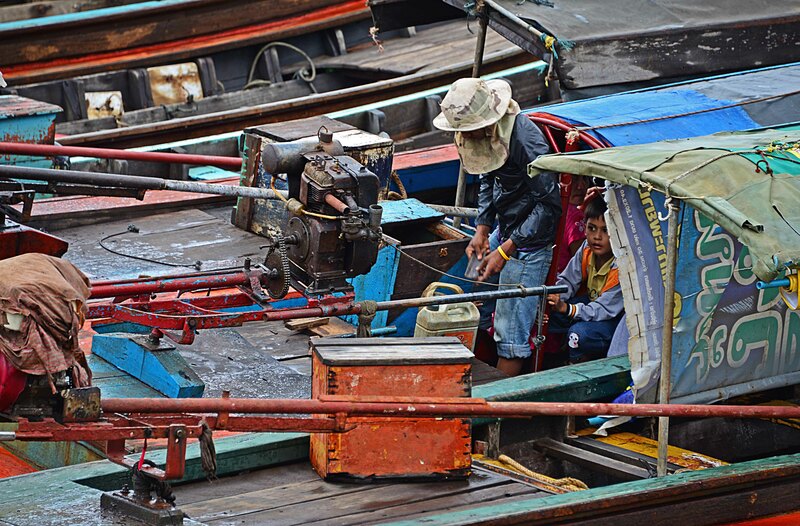 Locals barter for rides across to the other side of the river or elsewhere, so lots of photo opportunities to be had. I love to watch this type of interaction and the way the bartering situation is handled. Locals never seem to lose their cool but I think it’s a fun game whilst also their livelihood. Basically, we are chilling out in Ranong wiht not much sight-seeing involved. I really enjoyed the harbour with all the boats coming and going about their daily activities. This area is great for taking candid photos. The torrential rain made for quite dull, flat but moody scenery for most of our Ranong stay. For this mood, I like taking B&W photos, so I set my camera to the Monochrome setting for best shooting. 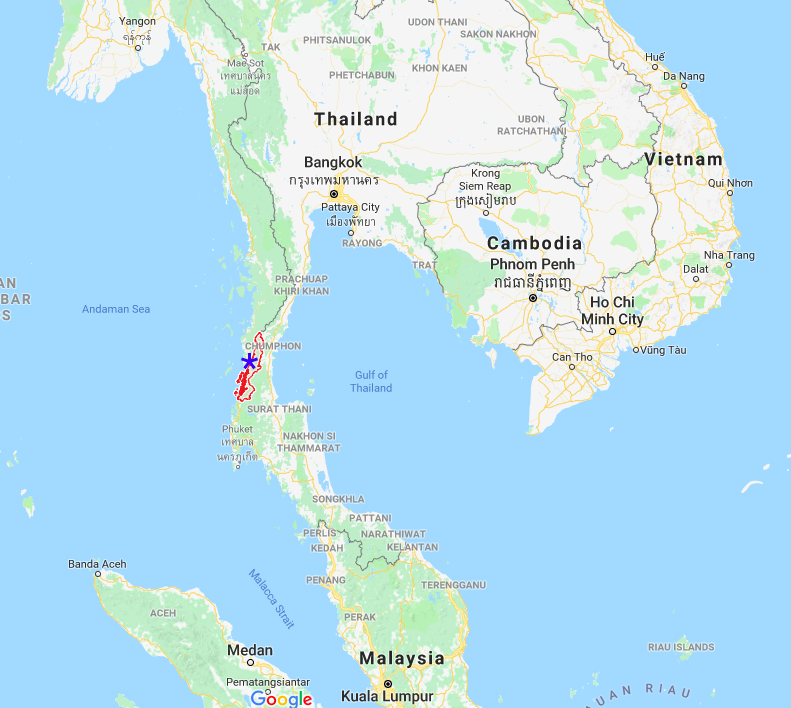 Apparently, there are two national parks (Ko Phayam National Park and Lamnam Kra Buri NP) and two waterfalls (Ngao Waterfalls and Ton Phet Waterfalls) within driving/riding distance of Ranong Town. I have to leave this for the next visit to Ranong in hopefully, drier conditions. After being spoilt in Khao Lak for five weeks in wonderful accommodation but also an abundance of multi-style accommodation on offer, Ranong is a little different. Not many ‘Falangs’ (foreigners) hang around Ranong for any length of time, but if you need some accommodation the Nalin Place offers a clean double room at around B477/night (no breakfast). Good, quiet accommodation in a newish hotel with friendly staff. A few minutes’ walk from the bus terminal, close to the food street stalls, and a ten-minute walk to coffee shops and restaurants. The room also has a small balcony but as it’s so wet, especially during the current wet season, the balcony is a waste. For the best coffee in town, visit the Together coffee shop on the main road. This coffee shop serves good Thai meals, cakes at cheap prices…even ham and cheese sandwiches, if you need a break from Thai food. I love Thai food and can eat it at every meal. I’m addicted to chicken Congee for breakfast, which is a delicious rice porridge with small chicken mince balls, coriander, and served with a few side spices to make it as hot as you like. If you’re not planning on crossing the border into Myanmar, the easiest way out of Ranong bound for Bangkok is by bus, which leaves at 08:30 or 20:00 every day, takes around either to nine hours, and at a cost of B466. Visit my Nilla’s Photography Thailand Gallery for more images. More blogs on Thailand. I like the best thai tropical fruit , such as rabutan, durian mangosteen, mango in Ranoung.i always spent my holiday while i was in kawthong, myanmar thai border. I have many friends in Ranong and we met each other and visited around the intresting places, espicially waterful .Thanks for your post. I also love the Thai tropical fruit, especially Rambutan and Star fruit, but I don’t like Durian…I think it’s an acquired taste. I really enjoyed Ranong and would like to return. I’ve just changed this post a little to make the photos larger, so see what you think.